You have many DIY decoration options for an outdoor wedding. An outdoor wedding is a fun tradition for many weddings in the spring, summer and even the early fall. Outdoor weddings have their own benefits, but many challenges as well. If you plan the wedding yourself, choose equipment and decorations that are simple and easy to put in place. No one wants a job that takes hours cleaning up after the wedding is over. Use common sense and your own sense of style and taste to choose the items for your outdoor wedding. Outdoor decorations should be simple and easy to put up and take down. For one of the easiest do-it-yourself wedding decorations, hang candles, or artificial candles, from tree branches. Create small hanging votive holders from baby food jars and craft wire. Place a small candle inside each, and place the lights all over the wedding grounds. 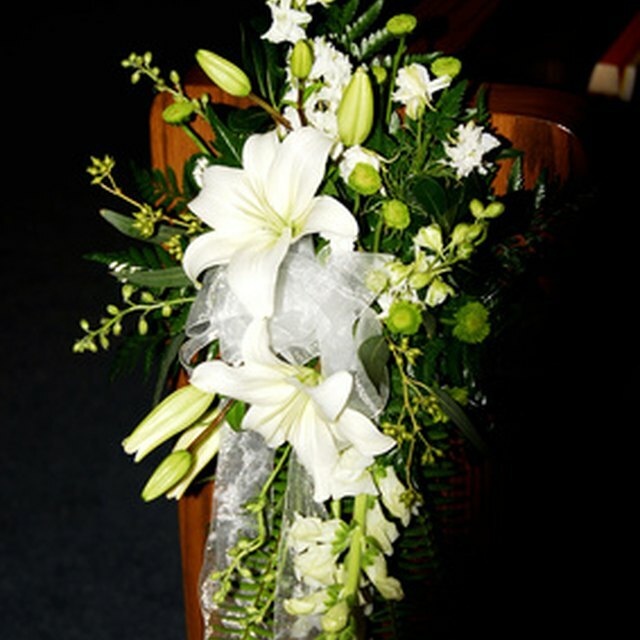 Place flowers and greenery around the area where you will get married. A wedding arch filled with flowers and fabric is a beautiful touch to frame the stage for an outdoor wedding. Use large pots and urns to hold flowers and greenery. Rent furniture from a wedding rental place for furniture with a uniform color and appearance. You can also use furniture borrowed from friends and family for an eclectic look. Wrap the backs of the chairs in swaths of fabric to tie the furniture collection together. Build a stage from wood pallets covered in fabric or painted with spray paint. Rent tables from a rental facility, or borrow the tables from a church or school that has a large supply of tables. Place tablecloths in your wedding colors over the tables to make them look more elegant. You can even use some old living room furniture during nice days to add a funky vibe. Make easy-to-transport table centerpieces from fish bowls or large glass vases. You can also use buckets full of twigs covered in Christmas lights as an unusual and woodsy centerpiece. Use additional wood pallets, or section off a large concrete area, as a dance floor. Rent a large tent if the venue is windy, or in case of bad weather. Large fruit arrangements placed on serving line tables work as decorations and food. Rent some sound equipment from a church or wedding rental facility. Some outdoor wedding venues already have sound systems included in the rental fee. Find a large speaker system so you can play music above the noise produced by wedding guests. Have a microphone available for giving toasts and for the officiator to use during the ceremony so guests can hear the exchange of vows. Have plenty of extension cords on hand to hook up the sound equipment.